Copyright: © 2018 MLRI & MCLE, Inc.
All chapters and exhibits from Lobbying on a Shoestring may be purchased individually. Expand the Table of Contents below to see all option. Lobbying on a Shoestring offers a common-sense, practical approach to political action. Premised on the idea that real people should have a real impact on the development of public policy, this powerhouse of a paperback conveys truths about the legislative process and hard-won, strategic insights. The 2018 Revised Edition gets you and your clients up and running to mobilize groups, assess the opposition, develop allies, and deploy media channels for real community change. 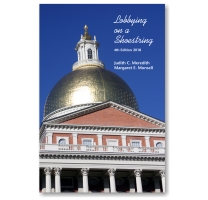 This fourth edition represents the latest revision of Lobbying on a Shoestring, which was originally authored by Judith C. Meredith and Linda Myer and published by the Massachusetts Poverty Law Center in 1982. Lobbying originally grew out of a handbook written in 1979 for participants in a legislative advocacy training conference presented by Terrance McLarney, Rochelle Lefkowitz, Robert Shaffer, Kathleen O'Grady, Robert James, Arlene Sen, Mary Kay Leonard, Maureen Holland, and others. This edition includes some material on the media (in chapter 9 and the appendix) written originally by Linda Myer, as well as new material and concepts from Real Clout and the Real Clout Workbook. The appendix also features some material that was originally written by Allan Rodgers and Tony Winsor of Massachusetts Law Reform Institute. The authors thank Georgia Katsoulomitis, current executive director at MLRI, for her thoughtful contributions to chapter 9. Real Clout: A How-To Manual for Community Activists Trying to Expand Healthcare Access by Changing Public Policy was authored by Judith C. Meredith and Catherine Dunham and published in 1994 by the Access Project and the Public Policy Institute. Real Clout was based on the premise that real people should have a real impact on health-care reform, starting with the expansion of access to care for those who needed it. It was based on the belief that involvement in the public policy process was good for community leaders. The Real Clout Workbook, published by the Public Policy Institute in 2003, was authored by Judith C. Meredith with the support of Cathy Dunham, Suejeanne Koh, and Jennifer Kennedy, each of whom developed and wrote sections of the workbook and provided extensive editing, design, and layout support. The Power Prism® Advocacy Framework material included in this fourth edition of Lobbying on a Shoestring was developed by Lori Fresina and Judy Meredith to capture the campaign model used by the Alliance for a Healthy New England, a campaign initiated in 2000 by Community Catalyst, the New England division of the American Cancer Society, and the Council of New England State Medical Societies. The reader is permitted to reproduce, cite, or quote from that publication provided that appropriate credit be given. The premise of Lobbying on a Shoestring is the conviction that real people should have a real impact on the development of public policy, and the belief that involvement in the public policy process is good for our nation.